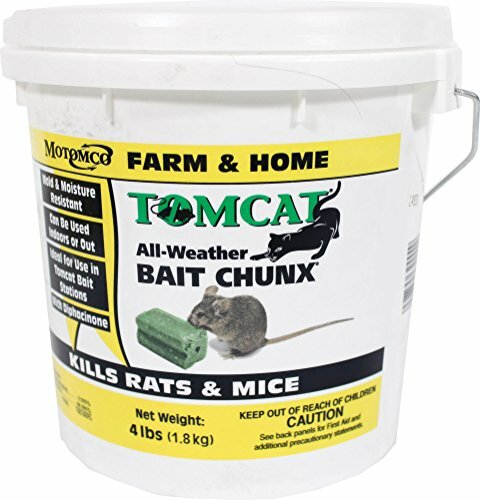 Tomcat all weather bait chunx.-Contains the active ingredient bromadiolone each packet contains 1.5 oz.-Diphacinone-0.005pct inert ingredients-99.995pct.-Tougher than a barnyard cat for controlling rats and mice.-Manufactured with human food-grade ingredients and enhancers for a bait so palatable that rats and mice cannot resist. Options:-Available in 4 pound and 9 pound sizes. If you have any questions about this product by Motomco, contact us by completing and submitting the form below. If you are looking for a specif part number, please include it with your message.